Claude Monet spent over 20 years building and painting his garden… and even though he painted dozens of masterpieces there, probably the one that comes to mind when talking about him is his water lily garden. There are many ideas for kid to paint his garden – but I did not find any for designing it. That’s when the foam and brushes with water came in. 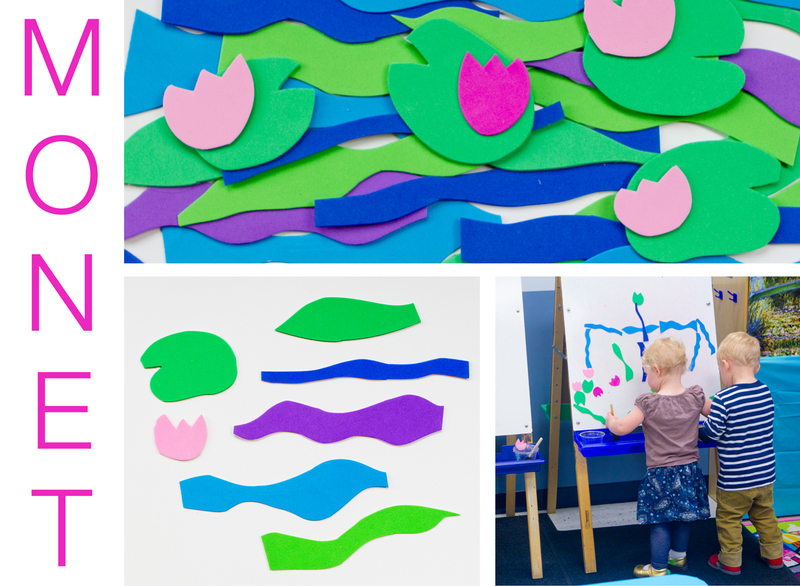 I cut different organic shapes out of the play foam – based on Monet’s paitning (color scheme as well as the fluid shapes) and let the kids use brush and water to stick them to an easel. They had a blast and came with so many different variations, it was fascinating to watch. I think Monet would love it! And if you want to try this at home, a great place is a bath tub – kids love creating huge, complicated images with foam shapes in the tub… the only problem is getting them out. This entry was posted in Art Projects and tagged art, ArTree, foam, garden, impressionism, kids, monet, preschool, project, water. Bookmark the permalink.